In this OFBiz tutorial we will be focusing on the Price Rules tab. The Price Rules tab in the catalog manager allows one to create very complex pricing structures based on basic price data and variables such as the customer, product, or quantity involved. For example, it would be possible to specify quantity discounts, special discounts for a particular group of products, for a particular group of customers, or pricing based on average cost rather than list pricing if certain conditions are met. Price rules are a series of rules which help determine the prices of products. Each rule is a series of conditions and actions. When Open for Business needs a price for a product, such as in an order entry or ecommerce application, it will search through all price rules and use the applicable ones to generate the price. With this OFBiz tutorial, we will go over how to add a price rule, and also how to edit an existing price rule. 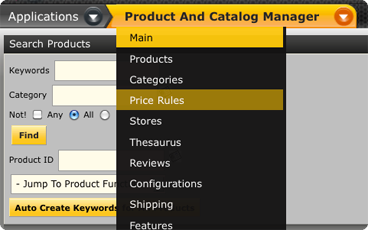 To Create or edit price rules, the user must be a catalog manager or administrator in the system. Price rules will only be run if an item has a List Price associated with it. Go to “Catalog” component and click on “Price Rules” tab. Fill in price rule name in “Name” field in “Add Price Rule” section. Added price rule will get displayed in “Global Price Rules” section. Click on “Edit” button to edit the rule. This is a rule that will take 10% off any product that is over $10.00. It is crucial to fill out all the options for the price rule to ensure the rule covers only the products you want it to. If the conditions field is left blank, the rule will apply to everything on the site. More then one condition can be added in to the price rule. Fill in above mentioned information again to create more conditions. More then one action can be added to price rule. 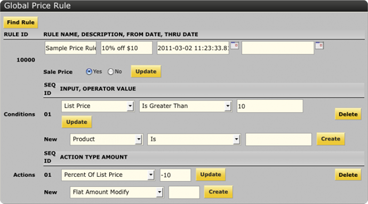 Price Rule will added and displayed on “Price Rules” page and “Find Price Rules” page. Price Rule will be applied on the added condition. Price rule should exist in system. Select the price rule by clicking on “Price Rule Id” in “Global Rules” section or by clicking “Edit” button. Update the existing details on “Price Rule” page. This is a rule that will take 10% off any product that is over $10.00. It is crucial to fill out all the options for the price rule to ensure the rule covers only the products you want it to. 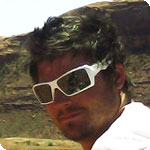 If the conditions feild is left blank, the rule will apply to everything on the site. Selected price rule information will be updated.